Fungal sinusitis poses a great diagnostic and treatment challenge to the otorhinolaryngologist. The increasing incidence of the disease, wide spectrum of clinical features, possibility of recurrence, invasion to vital structures such as orbit and brain, and treatment challenges make it a major health burden today. Often attributed to an immunoglobulin E-specific reaction or cell-mediated immune response to the fungal filaments, fungal sinusitis can be diagnosed by fungal stain and culture and histopathology (gold standard). Radiological studies help in assessing the disease extent and in planning management. We present our series of various forms of fungal sinusitis and the difficulties we faced in the management and the outcome. Each form of fungal sinusitis has distinctly different medical and surgical treatment which needs to be individualized, most often requiring radical surgical debridement along with adjunct long-term antifungals (polyene and triazole) playing an equally important role. The incidence of fungal sinusitis has been on the rise in the recent years and poses a major health burden. The manifestations depend on the host immunologic health. In immunocompetent patients, the sinonasal symptoms which are insidious in nature are commonly ignored and hence present to the ophthalmologist with symptoms of orbital involvement – proptosis, diplopia, and visual loss. In the immunocompromised group, the disease can run a rapidly progressive course with involvement of nose, orbit, and central nervous system. Almost half of the patients with invasive fungal rhinosinusitis may come to medical attention with orbital findings such as ophthalmoplegia, proptosis, and visual loss. It also poses a challenge in treatment because of its invasive nature and high chances of recurrence. The pathophysiology is often attributed to an immunoglobulin E-specific reaction or cell-mediated immune response to the fungal filaments. Fungal stain and culture help in identifying the etiological agent, while histopathology is the gold standard for diagnosis. Acute fulminant fungal sinusitis with fungal vascular invasion. Knowledge and identification of characteristic imaging patterns in fungal sinusitis help to refine the diagnosis, assess the disease extent, and plan management. Treatment needs to be individualized, and radical surgical debridement is the keystone in all the groups of fungal sinusitis. Adjunct long-term antifungals (polyene and triazole) play an equally important role in controlling the disease and preventing recurrence, along with reversal of immunosuppression. We had a total of 18 patients in our series of fungal sinusitis with orbital involvement. 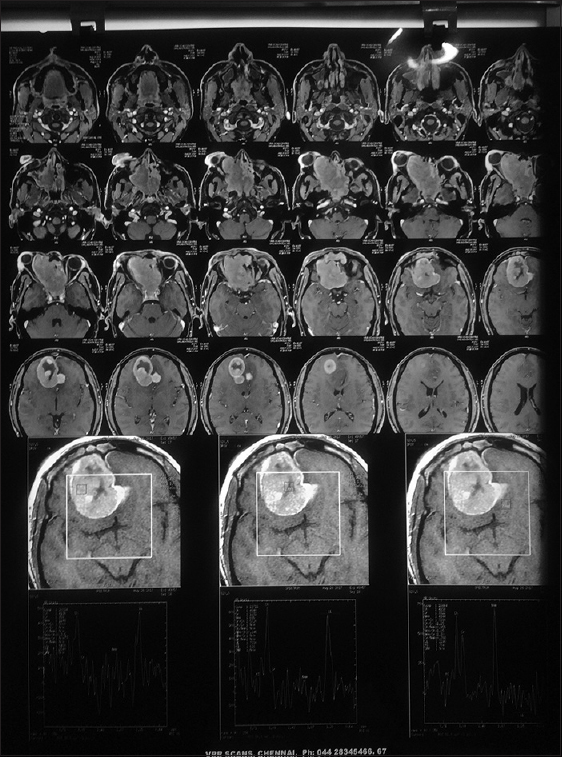 Here, we describe the case reports of three patients with varying spectrum, the challenges in the management, and their outcome. A 65-year-old male, case of hepatitis C virus-chronic liver disease, presented with left eye proptosis and nasal block of 25 days' duration. 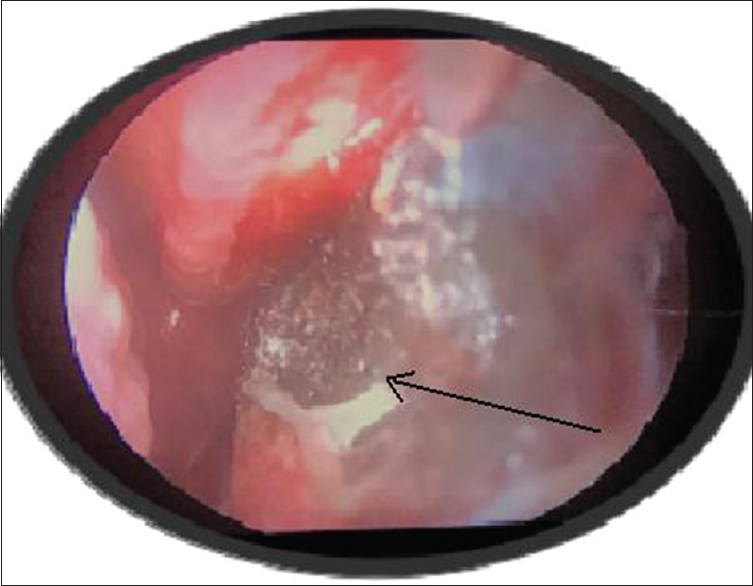 Diagnostic nasal endoscopy showed polyps in the left nasal cavity. Magnetic resonance imaging (MRI) peripheral nerve stimulation and orbit showed expansion and complete opacification of left frontal, maxillary, ethmoidal sinuses with involvement of the left orbit [Figure 1]. Endoscopic sinus debridement was done under general anesthesia. 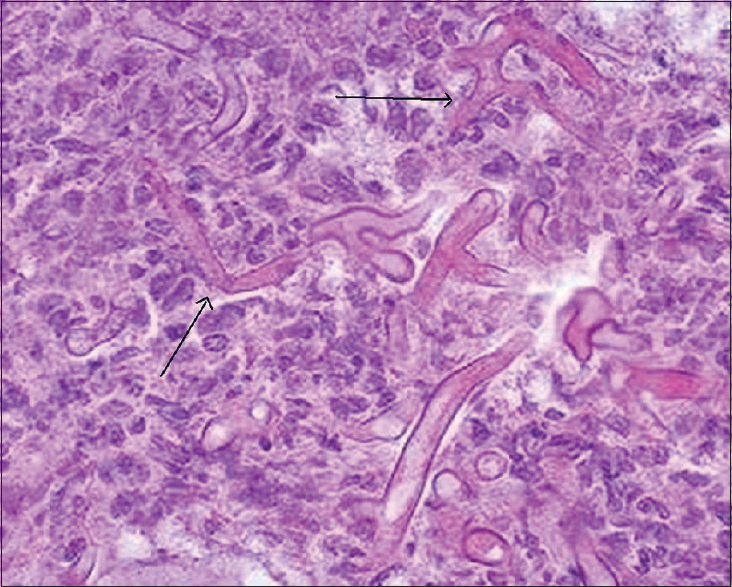 Extensive fungal debris and mucin was noticed intraoperatively in the sinuses with erosion of the lamina papyracea. Histopathology was suggestive of allergic fungal rhinosinusitis. Postoperatively, proptosis regressed and the patient has been on regular follow-up. A 37-year-old male [Figure 2], with no known comorbidities, presented with complaints of right eye proptosis, diplopia, nasal bleeding, and nasal block of 1 years' duration. 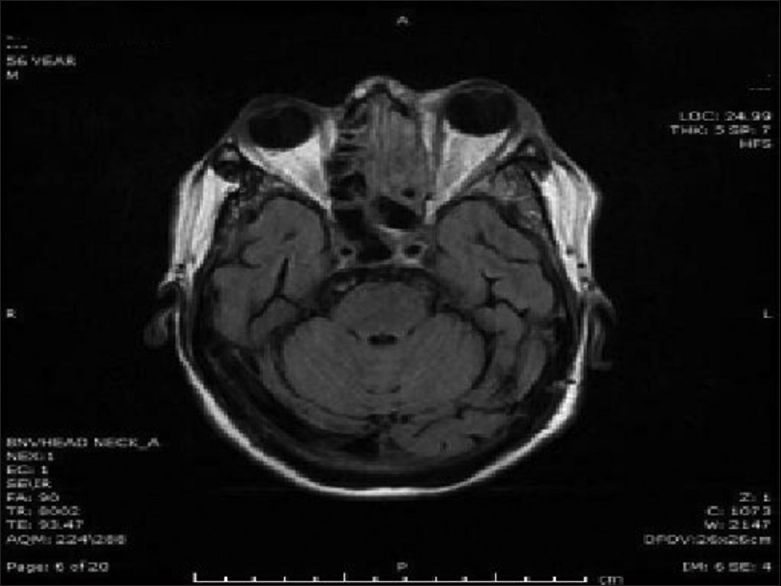 MRI showed large lobulated solid enhancing lesion in the sinonasal cavity extending into the orbit, with extradural extension [Figure 3] and [Figure 4] with a differential diagnosis suggestive of olfactory neuroblastoma/rhabdomyosarcoma. Endoscopic biopsy reported chronic granulomatous fungal sinusitis with septate fungal hyphae. He underwent endoscopic debridement of the mass; intra-operatively, the mass was soft, rubbery, and densely adherent to the medial rectus muscle. Fungal stain and culture grew Aspergillus flavus. Infectious disease consult was obtained postoperatively and the patient was started on oral posaconazole. On follow-up, there was significant reduction in proptosis, but diplopia persisted probably due to the chronicity of the disease and delayed presentation. He was subsequently referred for strabismus correction to the ophthalmologist. 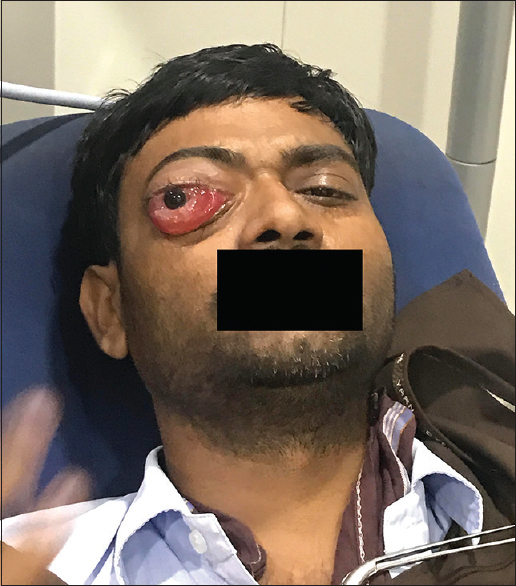 A 56-year-old male, a known diabetic on irregular treatment, was admitted to the Intermediate Care Unit with disorientation, facial pain, and nasal bleed of 2 days' duration and proptosis of the left eye for 15 days. On admission, his blood sugar was 1046 mg/dl with positive urine ketones. Ear-nose-throat (ENT) consultation was sought as computed tomography orbit showed left extraconal lesion with left pansinusitis [Figure 5]. 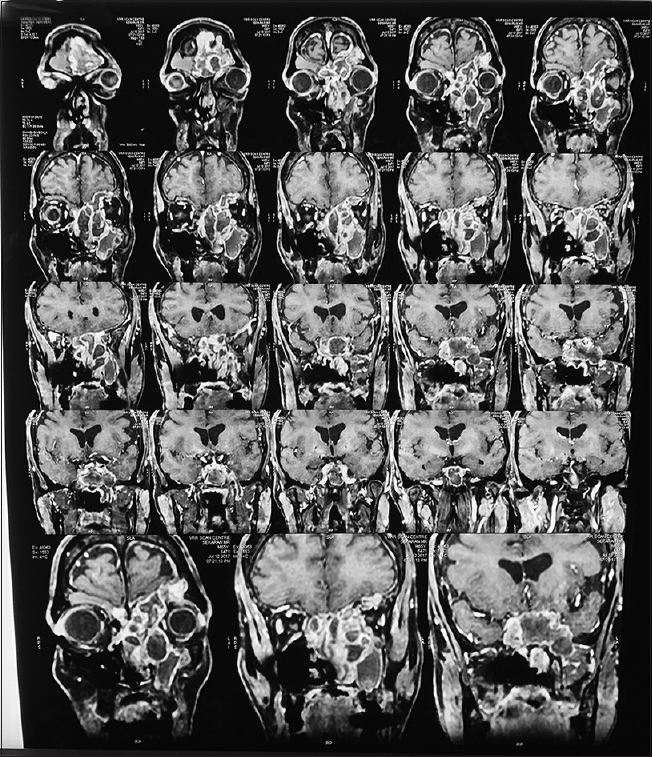 MRI showed pansinusitis with T2 hypointense foci in the left ethmoidal sinus extending into the extraconal space of the left orbit [Figure 6]. Diagnostic nasal endoscopy showed black necrotic eschar over the left side of septum with secretions from the middle meatus [Figure 7] which on fungal stain showed Mucorale species [Figure 8]. The patient was taken up for emergency surgery; intraoperatively, mucosal surface of the turbinates, ethmoidal sinus and septum was found to be necrotic with large eschar covering the posterior part of nasal septum. Radical debridement with posterior septectomy was done. Postoperatively, the patient received a total of 2 g of intravenous amphotericin B with regular office debridement. He was monitored by a team of physicians, nephrologist, intensivist, and infectious disease specialist during his hospital stay. 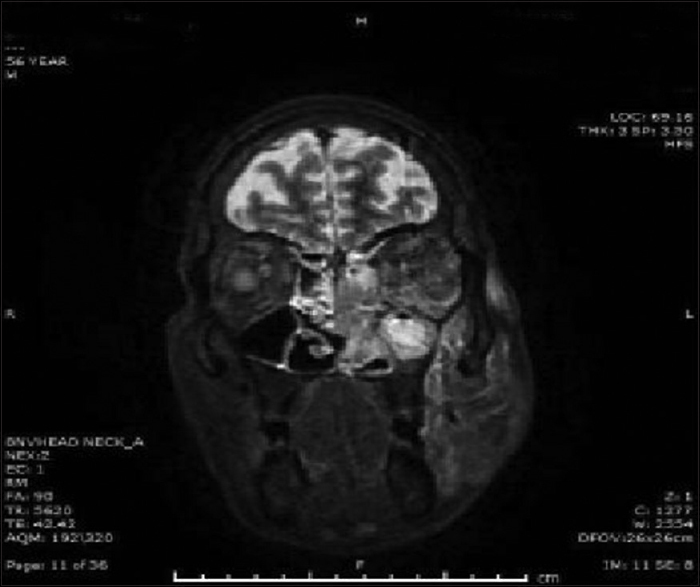 In view of early diagnosis and prompt surgical and medical management, the patient was discharged without any significant morbidity with oral antifungals. Early recognition, high index of suspicion and appropriate investigations help in planning specific treatment modality. Urgent surgical debridement and systemic antifungals leads to rapid recovery and also limits the spread of infection in the acute invasive group. Good outcome of patients with chronic granulomatous fungal sinusitis is possible with identification of fungus after fungal culture, surgical debridement and appropriate oral anti-fungals., A Multidisciplinary team consisting of ENT Surgeon, Ophthalmologist, General Physician, Infectious Disease Specialist is required to establish and ensure complete disease clearance. In the scenario of diabetes or other immunocompromised state, fungal sinusitis must be borne in mind. However, long term therapy, follow up and cost issue remain a major deterrent in terms of patient's compliance for treatment. We acknowledge Dr. Bipasha Mukherjee, Sankara Nethralaya, for her contribution. Ferguson BJ, Lee S. Cummings Otorhinolaryngology-Fungal Rhinosinusitis. Vol. 47. Saunders an imprint of Elsevier; 2015. p. 731-9. Chakrabarti A, Denning DW, Ferguson BJ, Ponikau J, Buzina W, Kita H, et al. Fungal rhinosinusitis: A categorization and definitional schema addressing current controversies. Laryngoscope 2009;119:1809-18. Gavito-Higuera J, Mullins CB, Ramos-Duran L, Sandoval H, Akle N, Figueroa R, et al. Sinonasal fungal infections and complications: A pictorial review. J Clin Imaging Sci 2016;6:23. Ferguson BJ. Mucormycosis of the nose and paranasal sinuses. Otolaryngol Clin North Am 2000;33:349-65. Mehta R, Panda NK, Mohindra S, Chakrabarti A, Singh P. Comparison of efficacy of amphotericin B and itraconazole in chronic invasive fungal sinusitis. Indian J Otolaryngol Head Neck Surg 2013;65:288-94. Singh A, Kumar B. Fungal pansinusitis leading to orbital complications in poorly controlled diabetics. Indian J Med Case Rep 2015;4:3-6. Chandrasekharan R, Thomas M, Rupa V. Comparative study of orbital involvement in invasive and non-invasive fungal sinusitis. J Laryngol Otol 2012;126:152-8. Rupa V, Thomas M. Different types of fungal sinusitis occurring concurrently: Implications for therapy. Eur Arch Otorhinolaryngol 2013;270:603-8. Selvam M, Pande A, Chakravarthy VM, Ramamurthi R. Invasive rhino-cerebral fungal granuloma. Neurol India 2010;58:270-6.